Minerva Model Railways announce the production of a fine-scale RTR, injection-moulded 0 gauge model of the Great Western Railway OPEN A wooden-bodied goods wagon in 7mm scale (1:43.5, for 32mm standard gauge). It follows is Minerva’s successful GWR IRON MINK and Gunpowder vans. 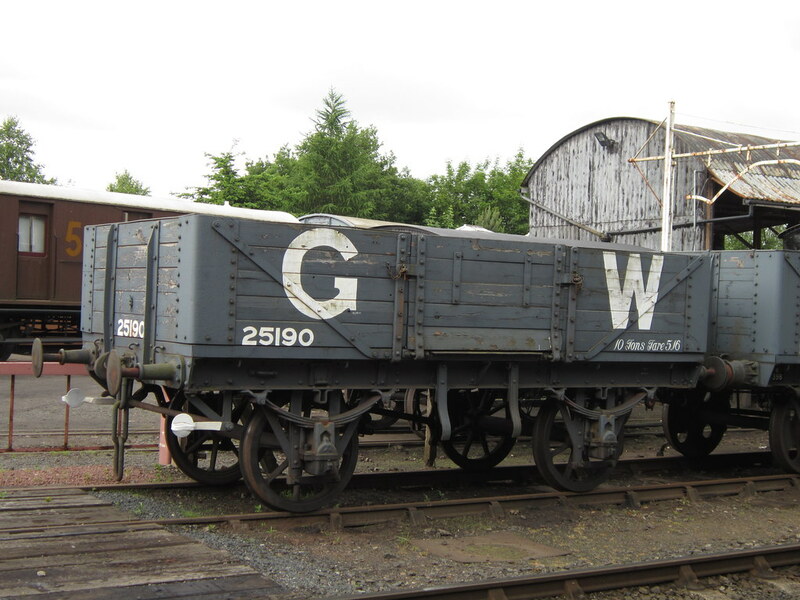 The Great Western Railway built a huge number of open wagons, designated eventually by the Code O. They ranged from one to seven planks and were ubiquitous throughout the United Kingdom. Minerva’s model depicts the five-plank version introduced around 1902-4 to Dia O4. The first were fitted with DC1 brake-gear, but this was changed to DC3 after a few years when the Board of Trade insisted on either side brakes. A large number were fitted with sheet supporting rails, but not all. Minerva’s model OPEN A is the first in a range of similar wagons, and comes with DC3 brake-gear and optional sheet rail. It will be available in four liveries: 1903 Great Western, 1923 GW, 1936 6” GW and British Railways unfitted. Three different numbers for each livery will be offered. The models feature a plastic injection-moulded body and chassis with full internal detail, metal-tyred wheels on shouldered axles fitted in compensated axle-boxes, sprung buffers and hook draw-gear with three-link couplings. A removable steel ballast weight is clipped to the underside of the floor to ensure good running. All versions will be £46.00 each plus £4 carriage per order. Orders for five or more wagons will be £43 each. Release is expected to be in late 2019. The models will only be available direct from Minerva Models via mail and telephone order, the Minerva website and from the Minerva Models’ stand at selected model railway shows. And convertable from 32mm to 33mm? Hopefully this time the wheelset can have a bearing and axle which are compatible with the Slater's "standard". How about providing some of each livery without numbers, for that those of us who shall be queuing for more than five, so we do not have to remove the supplied numbers? Stronger / stiffer coupling springs than the iron covered wagon please. Excellent news! Looking forward to this. Does "range of similar models" mean will also see some scale opens from the midland et al too ... I know Lionheart/Dapol announced some many moons ago?? Congratulations Minerva! If you need any image reference, please let me know as I have took alot of photos of GWR O4 25190 at the SVR. '25190' is lovely, but is not an O4. It has a O4 body rebuilt with a sack truck door (a common mod on many pre-1914-built opens) on an O3 chassis. '25190' does not have a solebar plate, and seems to be a fictional number, there being no record of it in either the O3 or O4 lot listings. What detail in the photo tells you that this is an O3 underframe? My reading of Atkins et al is that this is a diag 04 lot 455 but a trip to the NRM would confirm that. But, as suggested it no longer complies with all of the details of the original 04 as being modelled. The Churchward brake suggests it is not a later reuse of the number - as the GWR confusingly continued to do until its Nationalisation demise. The SVR (and Sheerness) wagon appears to have a top plank similar in width to the other planks, whereas an 03 would have a noticeably wider top plank. I'm warming to the notion of '25190' being an O4 - the quantity in lot 455 allows for the number, and there is some evidence that O4 headstock ends adopted the sloping O3 style at some stage during the O4 lot builds. If someone can sling a tape measure across the bodyside width of 25190, that would confirm it - if it's 7'6" it's definitely an O4 (albeit with later sacktruck door mod). If it's 8', then it's a cutdown O3 with bits of O4 ironwork on an O3 chassis. Gareth has a bunch of great pics of 25190 . Note the gusset between solebar and body underside - I don't think any O4s had those. These veterans from Sharpness could be just about anything. Wood and metal don't usually survive 120 years exposed to the elements. Credit to the SVR for taking it on. This would be on top of any repairs firstly the G.W.R made before B.R. got their hands on it. If you have a photo that shows the rivet arrangement, on the solebar, around the top of the axleguard, then I shall be very pleased to see same. I ask so that I can decide if the wagon no.29510 has a one piece axleguard (with a crown) or a two piece axleguard (where the two legs are separate). What evidence is there that the first wagons built to what became diagram O4 were built with Dean-Churchward brake gear? I ask because a paper read to the GWR Swindon Engineering Society circa 1903-04 has a drawing of a five plank open, very similar to the image posted by Chris, where the brakegear is single-side with a brake lever outside of the axleguard (rather like the arrangement of the contemporary iron covered wagons). Given that the "O4s" were in production by the date of the paper then I might expect to see a DC1 brake arrangement if that was what was being fitted at the time that the paper was published. Note the gusset between solebar and body underside - I don't think any O4s had those. I do not have a definitive answer to the question - what I can say is that the support for the curb rail, underneath the side door, does appear on drawings of wagon details (for 10T wagons) towards the end of the first decade of the twentieth century. GW general arrangement wagon drawings of that period often do not include all of the "standard" details, for example:- I have not seen the standard wagon label box on a GA, I think that part appears on a drawing of underframe details. Possible that the support plate was fitted as a result of a New Works Order and hence not necessarily fitted to all O4s. The first DC1 was fitted to a few 4-plankers in 1901, subsequently becoming diagram O5. The drawing shown in the engineering paper (The Carriage and Rolling Stock presentation by F. W. Marillier on 27 October 1903) is the same as fig 255 of Atkins et al, and does not show any brake gear. The DCI gear is shown on another drawing, figure 13. My guess is that the prime purpose of the main drawing is to show off the sheet supporter, as is mentioned in the presentation text. However, from the pushrod arrangement, the only brake that could have been used is DCI. None of this is absolute proof the first O4s were actually fitted with DCI, but all the evidence points toward it. As a qualification to my 'None of this is absolute proof the first O4s were actually fitted with DCI', John Lewis has reported that the first two lots of O4s were constructed with single-sided 2-shoe long-lever brakes, as per many pre-1901 Opens. (Subsequent lots were DCI.) For perspective, the first two lots are only a couple of hundred or so in the context of a total diagram volume of approx 3.3k. I've found this photo online and wondered if it's one like the planned Minerva release. I can't quite read the number. Not really no. This is a later wagon - different brakes, bodyside strapping (the edge-on ones either side of the side door aren’t on the Minerva wagon). It does have even planks though. You’re quite right - I was looking at the top plank but of course the wider one is lower in the later diagrams.